Wayfinder #11 - Cover art by Nick Russell. We're just a few days away from Paizocon 2014! The Encounter Table will be there Friday and Saturday, covering events and sharing surprises on our Facebook page! So please follow us on Facebook to keep up to date on all the goings-on at Paizocon and the big reveals at Saturday's Preview Banquet! Also debuting at Paizocon is issue #11 of the Wayfinder Fanzine! 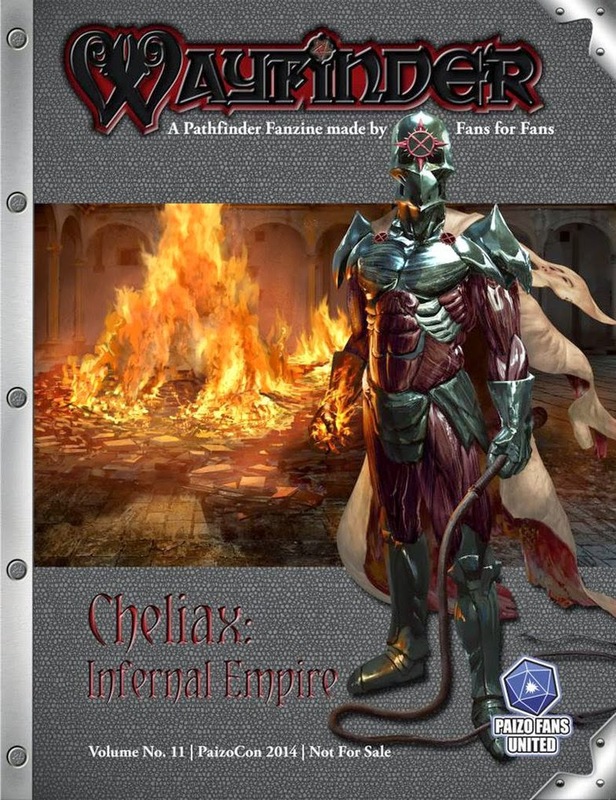 This issue's topic is the infernal empire of Cheliax, so if you cant get enough of diabolism, evil empires, and the people that are trapped in them we highly encourage you to head over to Paizo.com and check it out! Today's System Shock article is a supplement to the upcoming Wayfinder #11, and details the bezekiran monk archetype, modeled after Master Soan from Paizo's Pathfinder adventure module, The Pact Stone Pyramid. The article also gives background on the origins of the bezekiran style and this history Chelish martial arts! Let us know what you think of the article in the comments section or on Facebook! Rising up above a grove of red-leafed Minkan maple trees, the Shrine of Horns in Ergorian is home to exotic martial arts practices based on first-hand study of devils in battle. Decorated with tens of thousands of horns harvested from the remains of slain devils, the Shrine of Horns is a grim wood and stone monastery of with distinctly Tian architecture. Within these dour halls, monks from all across Cheliax and its allied nations study the fighting styles of captive devils in order to emulate their brutal efficacy. The Shrine of Horns is a recent construction of Chelish history with roots dating back to an age prior to the rise of diabolism and House Thrune. The origin of the Shrine of Horns is attributed to a Minkan monk named Akumatsu Korogana, a traveling martial artist from Tian-Xia who came to Cheliax in 4590 from Goka to research western martial arts forms. Korogana's research led to a chance encounter with a cabal of diabolists led by a nobleman named Agahman Thrune. Agahman was fascinated with Korogana's discipline and dedication to his craft and met with him frequently to discuss philosophy and religion. In the fall of 4591 Korogana was invited to witness a diabolist ritual held by House Thrune. The ritual, intended to summon a hamatula devil, went awry and unleashed the creature on the participants. Korogana was able to slay the creature, but not before being viciously wounded by the devil. In attendance at this meeting was Aligois Thels, founder of the modern-day Hellknight order and master of Citadel Demain outside of Ergorian. Having witnessed Korogana's defeat of the hamatula, Thels invited the monk to visit his citadel — usually off-limits to those outside the knighthood — and exchange ideas with the Hellknights. Unbeknownst to Korogana, the ritual had not failed, and Agahman had arranged the orchestrated scenario to put Korogana and Thels together with the intention of promoting an alliance between the martial arts master and the Hellknights. Much as Agahman had predicted, a common thread was found between Thels' Hellknights and Korogana and the two forged a relationship that fostered the growth of the Hellknights' martial training and further inducted Korogana into the cult of diabolism. By 4598 Korogana began teaching a handful of Hellknight students unarmed combat styles based on his experiences, not only with the hamatula he had battled but other devils summoned by the Hellknights at Korogana's request for "further study." In the coming years, Korogana built the foundation of what would become the hamalatulatsu and appointed talented armigers among the Hellknights as his disciples. Korogana founded the Shrine of Honors in 4604 in the city of Ergorian in response to the growing number of students he was training. The shrine, a monastery dedicated to the advancement of martial arts and philosophy, housed nearly one hundred aspiring monks. In 4606 the death of Aroden shook Cheliax to its foundations, resulting in a thirty year long period of civil war. House Thrune's rise to power during this time cemented Korogana's role as an instructor among the Hellknights in spite of a growing friction between he and Lictor Thels over who had authority to teach the hamatulatsu beyond the walls of Citadel Demain. Further complicating matters was Korogana's age. Nearly fifty years old, the matter of succession for the Shrine of Honors was a topic of additional contention, and one that Korogana himself found distasteful to discuss. With his own way of addressing the issue of succession, Agahman Thrune began courting Korogana's most promising student of the hamatulatsu in the summer of 4620. Siofan Alkthein, a fetchling woman, was shown considerable favor by House Thrune and afforded opportunities not commonly available to people of her race in an attempt to curry favor and position Siofan as a potential inheritor of the shrine. This also put Siofan in a spot where Agahman could potentially ask favors of her. As part of her indoctrination as an agent of House Thrune, Agahman covertly hired Siofran for a mission into Westcrown to recover the royal seal of Cheliax from the senile King Gaspodar, while at the same time seeding information to Gaspodar's court of an impending assassination attempt from within the ranks of his own honor guard. This act set Gaspard's retinue off guard and directed their attentions to an internal investigation when the real threat loomed beyond Westcrown's walls. In 4622 Siofan's attempt to steal the royal seal of Cheliax went awry, as planned by Agahman, culminating in the assassination of King Gaspard. On her return to Ergorian, Siofan was promised protection by House Thrune. Unfortunately, Korogana received word of Siofan's involvement in Gaspard's assassination through his own contacts and confronted her about the act. This confrontation ultimately led to a battle between Korogana and Siofan, one that she was not strong enough to win on her own. However, following her return to Ergorian, Agahman had placed Siofan under observation and the Thrune agents keeping tabs on her intervened in their battle, killing Korogana right before he would have struck a killing blow on Siofan. Indebetted to House Thrune, Siofan found herself placed directly as they had intended at the head of the Shrine of Honors, now effectively a puppet organization for House Thrune. In the years to come, Siofan's governance of the monastery would be dictated by Thrune. The death of Hellknight Lictor Thels in 4629 resulted in the appointment of Thrune-friendly Lictor Diaot, gradually building towards an inevitable Thrune-Hellknight alliance decades later. Following the end of the Chelish Civil War, the Shrine of Honors is rebranded the Shrine of Horns and decorated with the horns of devils that fought and died in the war. The gathering of horns would grow over the years to include devils bound in service to the monastery and those slain in training exercises for its students. The alliance between House Thrune and the Hellknights has fostered strong relationships between the Shrine of Horns and the Hellknights in return, with monks from the Shrine training alongside Hellknights and on occasion blending their ranks with remarkable results. The Shrine of Horns is organized into schools devoted to emulating a specific devil's fighting style and each school is led by a master with the title of devil sensei. These schools are in turn overseen by a single grand master, or Soke, currently represented by Siofan Alkthein (LE venerable fetchling monk 7/shadowdancer 5). Of the fighting styles practiced in the Shrine of Horns, the most famous is hamatulatsu, a form inspired by the fighting style of barbed devils. The Sisterhood of Eiseth in Westcrown and the Sisterhood of the Erinyes in Isger are among its most notable practitioners. However, hamatulatsu is but one of many fighting styles trained in the Shrine of Horns, each possessed of unique traits born of Hell's invention. Hamatulatsu: A brutal style focusing on breaking an opponent’s defenses through the use of intimidation, fear, and powerful blows emulates the fighting style of the hamatula, or barbed devil. Monks of the hamatulatsu school treat spiked gauntlets as a monk weapon. Bezekiran: Founded by Master Soan, the bezekiran monk style emulates the ferocious power of hellcats — bezekira — and emphasizes quickness and savagery, putting their students through rigorous and painful tortures as part of their training. Bezekiran monks treat punching daggers as monk weapons. Gelugetsu: Born of the intelligence and lethality of the gelugeon or ice devil, the Gelugetsu school trains its monks in freezing cold environments far from Cheliax as part of their initiation. The gelugatsu monks learn to hone their weapon skills far beyond their unarmed talents and treat the longspear as a monk weapon. Osylutanyo: The cold and emotionless monks of the osylutanyo school devote their lives to the study of poisons in emulation of the bone devils —osyluth— and learn how to render themselves immune to venoms and lace their unarmed strikes with poisonous quality. Osylutanyo monks treat the scorpion whip as a monk weapon. Phistophilatan: Contract devils, otherwise known as phistophilius, are the inspirations for the phistophilatan monks, an order of contemplative mystics that devote their very souls to a synergy of arcane and martial art. Vows and pacts are of the utmost importance to phistophilatan monks who treat the spiked chain as a monk weapon, representing the binding chains of their vows and contracts. Barbazutan: The bearded monks of the barbazutan emulate the bearded barbazu devils. Fearsome combatants, these monks learn to cause wounds with their unarmed strikes that bleed profusely. Barbazutan monks treat the glaive as a monk weapon. In the Shrine of Horns in Ergorian, the capital of Cheliax, House Thrune trains lethal monks in the brutal bezekiran martial art. This ferocious style forsakes many of the trappings of typical monastic training to emulate the invisibility, speed, and lethality of the hellcat. Alignment: Bezekiran monks must be Lawful Evil. Bezekira Pounce (Ex) At 1st level a bezekiran monk may make a full-attack with unarmed strikes or monk weapons at the end of a charge so long as he is unarmored and unencumbered. This ability replaces flurry of blows. Bezekira Rush (Ex) At 1st level when a bezekiran monk is unarmored and unencumbered he gains a +10 enhancement bonus to his land speed. This bonus increases to +20 at 3rd level and an additional +10 at every 3rd level thereafter. This ability replaces fast movement. Predator's Defense (Ex) At 1st level a bezekiran monk gains a bonus to natural armor equal to his Constitution modifier. In addition, a bezekiran monk gains a +1 dodge bonus to AC at 4th level. This bonus increases by 1 for every four monk levels thereafter, up to a maximum of +5 at 20th level. This ability replaces a monk's normal AC bonus. Infernal Aggression (Ex) At 3rd level a bezekiran monk gains a +2 bonus on Reflex saving throws versus evocation spells. Crucible of Pain (Ex) At 5th level a bezekiran monk gains damage reduction 5/— versus nonlethal damage. At 10th level the damage reduction granted by this ability improves to 10/— and also grants the bezekiran monk immunity to spells with the pain descriptor. This ability replaces purity of body. Bezekira Invisibility (Ex) At 12th level as a swift action a bezekiran monk can disappear for 1 round per level. This ability functions as invisibility. At 16th level this ability functions as greater invisibility. Using this ability uses up 1 ki point. This ability replaces abundant step.